The Riksdag Administration is led by the Riksdag Board. The Secretary-General of the Riksdag is the head of the Riksdag Administration. The Riksdag Board leads the Riksdag Administration and participates in the planning of the work of the Riksdag. The Speaker is the Chair of the Board. The Secretary-General of the Riksdag is the head of the Riksdag Administration. 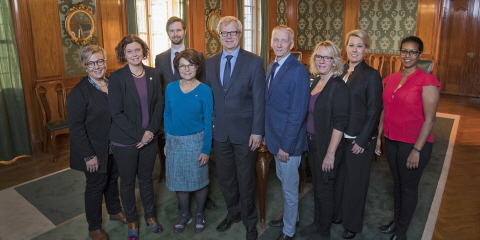 The Office of the Speaker and the Secretary-General assists the work of the Speakers and the Secretary-General of the Riksdag, and coordinates projects carried out by the Riksdag Administration, environmental management efforts and activities connected with internal management and control. The Secretariat of the Chamber helps with the planning and implementation of work in the Chamber, the Riksdag's international contacts, the Riksdag Research Service and legal matters, and coordinates EU business within the Riksdag Administration. The Committee Services Division is responsible for support to members in their work in the committees and the Committee on EU Affairs as well as evaluation and research. The Administrative Division is responsible for administration of members, human resources and finance. The Service Division is responsible for the Riksdag buildings, security and internal service. The IT Division is responsible for ensuring that all operations have appropriate and reliable IT support. The Communications Division is responsible for providing information and factual background material about the Riksdag, its work and the EU. The work of the Riksdag is led by the Speaker. A special board - the Riksdag Board - deliberates on the planning of the work. The Riksdag Board can present proposals in the Riksdag regarding the way in which the Riksdag's work is to be carried out. The proposals may, for example, concern gender equality in the Riksdag, how the Riksdag is to deal with EU-related business, or the handling of private members' motions. The Riksdag Board also directs the Riksdag Administration. The Board comprises the Speaker who is chair, and ten other members who are chosen by the Riksdag from among its members. The Speaker is entitled to vote in the Riksdag Board. The Deputy Speakers, those of the group leaders who are not members of the Board, and the Secretary-General of the Riksdag may participate in the deliberations of the Board. 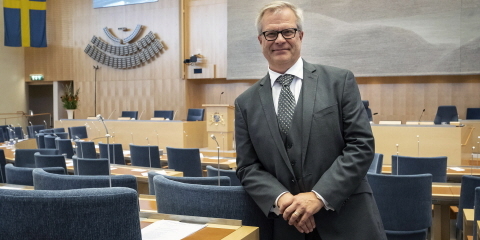 The Council for Members' Affairs is a body coming directly under the Riksdag Board and which is headed by the Secretary-General of the Riksdag. The Council deals with administrative issues of special interest to members of the Riksdag, such as accommodation, travel provisions and technical equipment. In addition to the Secretary-General of the Riksdag, the Council comprises one member of each party in the Riksdag. The Secretary-General of the Riksdag is Head of the Riksdag Administration. The Secretary-General is responsible for and presides over the Administration in accordance with directives and guidelines from the Riksdag Board. The Secretary-General of the Riksdag is chosen by the Riksdag. The election is prepared by a group consisting of the Speaker and the group leaders of all the parties represented in the Riksdag. The Office of the Speaker and the Secretary-General assists the work of the Speakers and the Secretary-General of the Riksdag. The Office of the Speaker and the Secretary-General includes the secretary to the Secretary-General and the Speaker's press officers. The Office of the Speaker and the Secretary-General also coordinates projects carried out by the Riksdag Administration, environmental management efforts and activities connected with internal management and control. The Secretariat of the Chamber plans and implements the work of the Chamber. 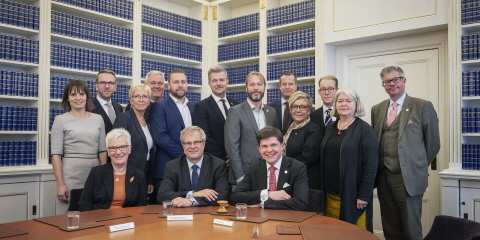 The Secretariat of the Chamber comprises the Secretariat, the Central Bureau, the Legal Services Department, the Department for the Parliamentary Record, the International Department and the Riksdag Research Service. The EU Coordination Secretariat coordinates the Riksdag's work with EU business. The Secretariat serves as an internal and external point of contact for EU-related work in the Riksdag and is responsible for the handling of EU documents. The Permanent Representative of the Swedish Parliament to the EU institutions is linked to the EU Coordination Secretariat. The Central Bureau examines the members' motions, interpellations and written questions to ensure that they comply with the Constitution and the Riksdag Act. producing the Riksdag's written communications to the Government. The Legal Services Department deals with legal aspects of the Administration's work, draws up statutes and other rules, as well as the Riksdag Administration's central register of documents. 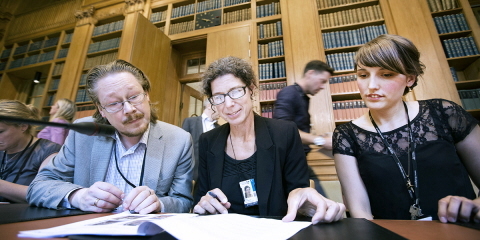 The Legal Services Department is also responsible for the Riksdag Archives and registry. Furthermore, it is responsible for information and IT security in the Riksdag Administration. The official reporters of the parliamentary record write down everything that is said in the Chamber. This is later published in the parliamentary record. The Department is also responsible for language revision of the parliamentary documents and for translation into English. The Research Service carries out research assignments on behalf of members of the Riksdag and the political parties. The activities of the Research Service are determined by the assignments it receives. This means that staff only carry out research following a request from a commissioning party. There are different reasons behind the assignments the Research Service receives. It may be that a party secretariat or member of the Riksdag wants to understand a particular development or occurrence better. Perhaps they need background material to develop their policies. Another common situation is that a party wants to substantiate a political proposal with facts. The research reports are used, for example, in media debates, private members' motions, interpellations and in debates in the Chamber. After a dialogue with the commissioning party and on the basis of established research methods, the Research Service decides how to organise and implement the assignment. In its research reports, the Research Service provides an objective view and independently formulates the contents of its analysis and conclusions. As the Research Service works impartially, it is not part of its assignment to help out with political activities such as writing speeches, drafting private members' motions or formulating political initiatives. During the drafting process, secrecy applies to the Research Service's assignments. This means that they only become public if and when the commissioning party refers to the report or parts of it in a public context, for example, in the media or on the Internet, or if the commissioning party agrees that secrecy shall no longer apply. The Research Service currently has around 35 qualified researchers with various fields of expertise, including lawyers, economists, political scientists and natural scientists. Together, they carry out some 2,000 assignments per year within all subject areas. Around 80 per cent of the assignments come from members or parties in the Riksdag, but the committees, the rest of the Riksdag Administration and other parliaments are also important commissioning parties. All the parties in the Riksdag make use of the Research Service. The International Department of the Riksdag handles the Riksdag's international contacts and assists the Speaker and Deputy Speakers with their international commitments. The number of international visits and contacts with other parliaments has increased drastically in recent years. The Riksdag's international activities include the Speaker's visits and trips around the world, visits during which the parliamentary committees exchange experience with committees from other parliaments and visits and study trips by various Riksdag delegations. The Riksdag also helps to support young democracies in their parliamentary development. The process of internationalisation has led to an increase in the number of international parliamentary assemblies. Secretariats staffed by non-political appointees help the members of the Riksdag in their work in the parliamentary committees and the Committee on EU Affairs. Together the secretariats and the Parliamentary Evaluation and Research Unit make up the Committee Services Division. In total there are 15 parliamentary committees in the Riksdag. Each committee has its own secretariat, headed by a head of secretariat and staffed by between five and ten officials. The committee secretariats help the members with background materials for decisions, writing statements on certain EU documents and following up and evaluating the Riksdag's decisions. They also provide help for work with issues relating to research and the future. The officials who are responsible for preparing and presenting business to the members of the committee are known as committee secretaries. The officials also include clerical staff who are responsible for the day-to-day work of the secretariat. The officials are non-political appointees and retain their posts even if the political majority in the Riksdag changes after an election. The Government is obliged to consult the Committee on EU Affairs on EU-related business. Like the 15 parliamentary committees, the Committee on EU Affairs comprises 17 members of the Riksdag. The Secretariat of the Committee on EU Affairs is staffed by one head of secretariat and five officials. The Parliamentary Evaluation and Research Secretariat provides support for the committees in their work to follow up and evaluate the Riksdag's decisions and with issues relating to research and the future. The committees' follow-ups, evaluations and research reports are published in the series Reports from the Riksdag. The Reports from the Riksdag series also includes the committees' public hearings. The Administrative Division comprises the Finance Department, the Human Resources Department and the Department for Administrative Services for Members. The Division provides administrative support to the Office of the Parliamentary Ombudsmen and coordinates administrative support to boards under the Riksdag such as the Election Review Board and the Riksdag Remunerations Board. The Finance Department is responsible for tasks relating to financial administration. In addition, one of its primary responsibilities is to prepare proposals for appropriations in the central government budget for the Riksdag and Riksdag Administration. The Finance Department also prepares proposals for the annual reports and four-month reports for the Riksdag Administration and for appropriation directions for the authorities under the Riksdag. The Department coordinates procurement activities and pays out support to the parties and party groups in the Riksdag. The Human Resources Department is responsible for tasks relating to human resources and salary administration. It is also responsible for negotiations on collective agreements for the Riksdag Administration and, at a central level, for the authorities under the Riksdag. Support to managers in human resource matters and for skills development is also among the responsibilities of the Department. Furthermore, the Human Resources Department coordinates work environment issues, is responsible for preventive healthcare and mediates occupational health services for the MPs and employees. The Department for Administrative Services for Members is responsible for administrative matters connected with the MPs such as members' pay, economic benefits and pensions. The Department is also responsible for the introduction of new members of the Riksdag and alternate members. When an MP leaves his or her assignment, the Department helps out with matters relating to guaranteed income and financial redeployment support. Matters relating to travel by MPs and employees of the Riksdag Administration are also dealt with by the Department. The Service Division is responsible for the Riksdag buildings, security and internal services. The IT Division is responsible for providing IT support to the members of the Riksdag, the Riksdag Administration and the party group secretariats. The Division develops and maintains IT services and is responsible for the Riksdag's IT architecture and technical infrastructure. The IT Division also produces all TV broadcasts from the Riksdag. The Communications Division is responsible for promoting increased openness and access to information and for providing factual background material about the Riksdag, its work and the EU. The Communications Division comprises the Department for Communications Planning, the Department for Media, Communications and Digital Development, the Department for Visits, Education and Events, the Riksdag Library and the Democracy Centenary Secretariat. The Communications Division has about 110 employees. The Department for Communications Planning is responsible for communications strategy, the Riksdag's graphic profile and brand, the Riksdag intranet and printed material. The Department for Media, Communications and Digital Development is responsible for media issues, the websites www.riksdagen.se and eu-upplysningen.se, the Riksdag's open data and an information service about the Riksdag and the EU. The Department for Visits, Education and Events is responsible for visits to the Riksdag. Guided tours are organised for the public every week. School classes are also received for study visits and special materials are produced about the work of the Riksdag and the EU, which can be used by teachers in the classroom. Furthermore, the Department is responsible for planning and implementing events. The primary task of the Riksdag Library is to provide the Riksdag with background materials for decisions. The Library also offers monitoring and information retrieval services for members and officials of the Riksdag. The Library specialises in law, political science and parliamentary documents and is open to the public. The Riksdag is commemorating the advent of democracy in Sweden with a democracy centenary that is taking place between 2018 and 2022. The Democracy Centenary Secretariat was established at the Communications Division in February 2018. The Secretariat will be commemorating the centenary with various activities.